What events can benefit from John Harding's magic? Be it an elegant wedding breakfast or a funky reception, a rocking freshers' week or a formal graduation ball, a busy trade exhibition or an annual fundraiser, a late night comedy club or a company Christmas party, a society event or a family get-together, John has the show and the experience to suit. Make your special day extra special. 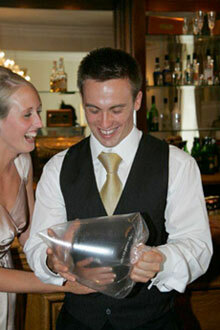 If you are looking for a wedding magician John has entertained at hundreds of weddings and civil ceremonies, as a close up magician during photographs, a table magician at the wedding breakfast and as an illusionist or comedian during the reception. You will love hearing the gasps of amazement and roars of laughter around the room and seeing the delight in the eyes of your family and friends. John will make your wedding a day to remember for you and your guests for years to come. Click here to request John's FREE advice pack for a successful wedding (not tips for a successful marriage - that's different sort of advice altogether!). 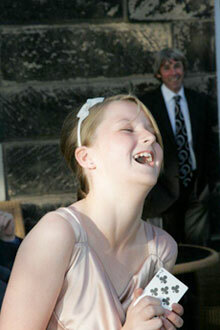 You performed at our wedding reception on the Wirral. All our friends still talk about it and you where certainly the highlight of the reception, if not the day. We would like to say a big thank you for being a fantastic part of our wedding day last Saturday at Rowton Hall. Everyone thought that you were brilliant. We will definitely be recommending you to other people. Thank you for your entertainment at our wedding. Everyone has been commenting on your act - You were certainly a highlight of the reception. It was wonderful to see the look on our friend's faces. Magic really brings people out of their shells and John has the perfect blend of humour and wonder to add instant atmosphere to any event. Whether you are celebrating a special birthday or anniversary, entertaining clients, raising money and awareness, having a golf presentation, Captain's evening or a Christmas night out he's the perfect choice. 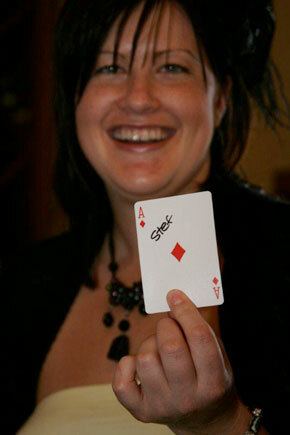 Close-up magic around the tables, a magic show at the drinks reception, fire-eating on the lawn or comedy before the dancing, with an entertainer this versatile the sky is the limit. Thank you for your part in our Centenary Dinner celebrations.. From the sound of applause and the 'oos' and 'ahs' going around the room you certainly wowed our guests. You're a star John, your magic went down really well - everyone had said how impressed they were. Many thanks for Friday, it was a great night and everyone said how much they enjoyed your act. You were fantastic. If you are looking for a sure fire way of attracting people to your business, communicating a sales message or thanking clients and staff, look no further. Whether it is outreach, point of sale, trade show or fun day John knows how to deliver a crowd and deliver a message. The result for you is happy, entertained, motivated staff and intrigued, pre-qualified leads, time and time again. 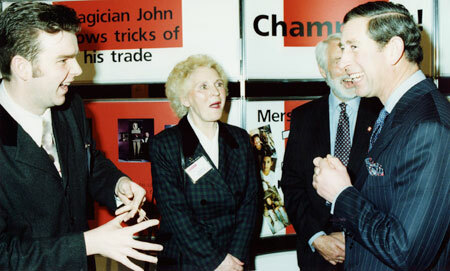 John can design bespoke magic and routines, incorporating your message seamlessly into his presentation, educating your future clients whilst entertaining them. You know how children learn more when they're having fun? It's the same for all ages and John has the perfect way of achieving that. Your exhibition stand will be the envy of your competitors, and it can cost a fraction of other forms of promotion. The same principles apply to team building and staff training days. A happy, engaged group are better motivated and benefit more. Why not book John for your next company fun day and see for yourself? All new clients for this service receive a 10% discount. Visit teambuildingmagic.co.uk for more information. Thanks again for your help - You were the driving force behind our campaign. Thank you for the considerable input you have made to our various customer events. The look on peoples faces is a joy to see! You have been an excellent ambassador for our dealerships. Thank you so much for your wonderful entertainment during our staff conference. The feedback we have received has been superb. John has specialist experience performing restaurant magic to help in building sales, improving customer retention and generating growth for restaurants. He's spent 15 years as resident magician and entertainment consultant for restaurant chains right across the country, with some units experiencing an incredible 40% sales growth thanks to his work. If you would like him to help your restaurant grow get in touch for in depth testimonials and case studies, and look out for the launch of restaurantmagicians.co.uk. As Operations Director of Chiquito restaurants I employed John Harding as a magician. The sales improvement in the store was over 80% over an 18 month period. Based on John's success we spread "the magic experience" through John Harding to over 30 Chiquito restaurants across the country.